Ronald A. Marwitz was born on March 16, 1931 in Chicago to Arthur and Kathryn (nee Reeder) Marwitz. 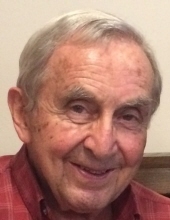 He died Saturday, March 16, 2019 in Arlington Heights. Ron was a Chicago native. The Chicago Boys Club formed a great foundation to Ron’s youth and he remained connected and active for his entire life. He and his wife were dedicated members of St. James Catholic Church in Arlington Heights. They led many activities to support the parish work as a community and in the community. As members of the Third Order of St. Francis, they dedicated their lives to Franciscan Outreach. Ron proudly held a bachelor’s of science engineering degree from Fournier School of Technology and a graduate degree in Statistics from the University of Chicago. As the head of Marketing and liaison to the FCC, Ron was a leader for Motorola in Schaumburg. He was past chairman of the Chicago Northwest Unit of the American Cancer Society and named volunteer of the year for the State of Illinois. Ron dedicated his life to family, service and education. Ronald is survived by his children: John (Deb) Marwitz, Annemarie (Jeff) Kallenbach, Stephen, Joan (the late Don Ostopowicz) and Ed (Noel Adams); grandchildren: Jennifer(Jason) McMahon, Amy(Ted) Max, David (Larissa); Megan (Matt) Unger, Matthew (Jenna), Melissa; Lisa (Kurt) Runge, Sarah (Matt) Bey; Kathryn, Amanda (Alex) Wagner, Jackson; and Katya Ostopowicz; Great-grandchildren: Tyler, Peyton, and Evan McMahon; Addison, Ariana, and Asher Max; Elijah, Isabel, and Micah Runge and Emma Bey. He was preceded in death by his wife and love of his life, Jean (nee Collins); son, Timothy Marwitz; and sister Arleen and brother in law Richard Wayne and parents. A Memorial Mass will be held at a future date. Donation’s in Ron’s memory may be made to Franciscan Outreach, Chicago IL by contacting Laura at laura@franoutreach.org or (773) 278-6724 or online at www.franoutreach.org/donate-now <http://www.franoutreach.org/donate-now>. "Email Address" would like to share the life celebration of Ronald Arthur Marwitz. Click on the "link" to go to share a favorite memory or leave a condolence message for the family.